Aragonite – usually colourless, but impurities bring shades of blue, green, pink or yellow. Fluorite – purples, blues, greens. As prized as any of the quartzes and as beautiful as amethyst. Beryl - This group includes Emerald, Aquamarine, Morganite, Heliodore, Red Beryl and Goshenite. 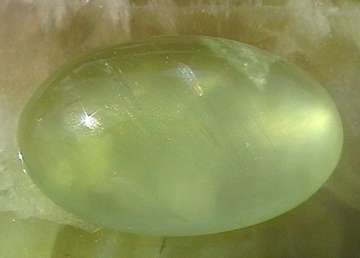 Chrysoberyl – yellowish green to brown. Chrysoberyl also has two other varieties: Cat's Eye (also known as Cymophane) which has an inclusion of silver running through it, giving a cat's eye appearance, and Alexandrite, a rare gemstone that changes colour from emerald green to violet, depending on the light . Most Alexandrite available is created in a laboratory, re-creating stones with the exact same chemical composition as the natural stone, which is still expensive, or imitation. 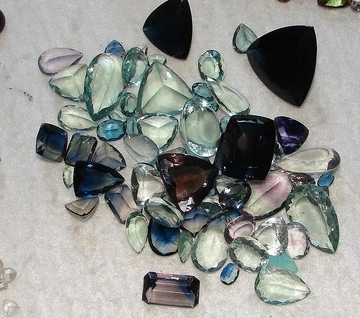 Czech designers, Murano glass makers and Swarovski also produce glass crystal stones marketed as alexandrine in colour. Corundrum – in two varieties: Ruby (the red form) and Sapphire (the remaining colours, including of course, blue). 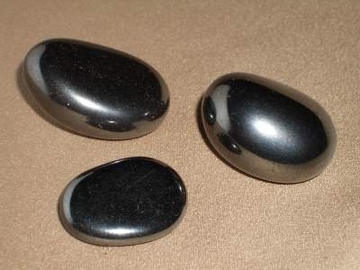 Hematite – steely grey or black (reddish brown in powdered form). 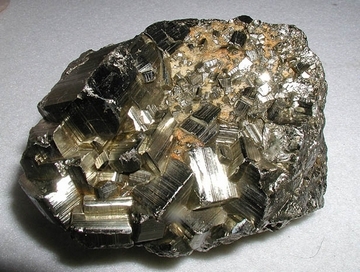 Magnatized Hematite, so popular with many jewellery makers, is created by magnetizing simulated Hematite - also known as Hemalyke. Natural Hematite, a compact form of iron oxide (otherwise known as rust!) cannot be magnetized. Spinel - red, similar to Ruby to which it has a similar chemical composition and is almost as valuable. Spinel can also be black, blue brown, green or purple. 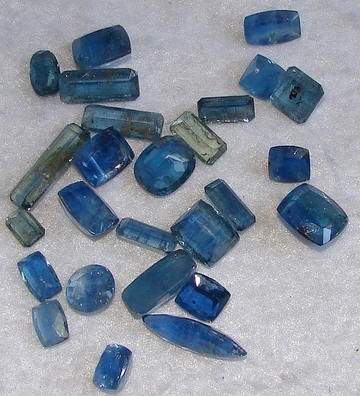 Apatite - usually green in colour, but may be white, colourless, yellow, bluish, reddish, brown, grey, or purple. Not often used in jewellery making as it is relatively soft. Turquoise – the famous turquoise colour varies from greenish blue to sky blue. It is a relatively soft mineral and stones are often impregnated with resins to stabilize them. This group includes the Garnet group: Almandine, Andradite, (greenish grey to black) Grossular (goosberry green to cinnamon), Pyrope, (red, also known as rhodolite) Spesartine, (orange, reddy brown), Uvarovite (bright green) which are all varieties of the stone marketed as Garnet, with red (or sometimes brown to purple) being the most common. Howlite – white to grey with black markings, similar to turquoise. 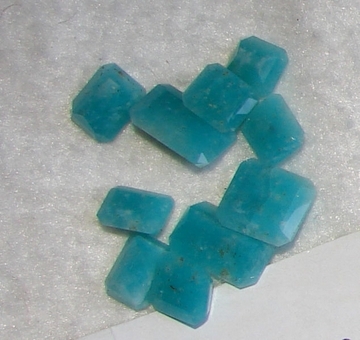 It is often dyed and substituted for turquoise. Olivine – also known as Chrysolite and Peridot – light green to yellowish green. Zircon (not to be confused with the artificial Cubic Zirconia, the imitation diamond) – colourless but also brown red and green and, when heat treated, yellow and blue. Zircon has often been used in place of diamonds having a similar lustre and fire (the sparkle of diamond). 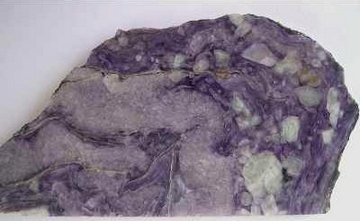 Zoisite –variable colours but mainly green. The blue variety is known as Tanzanite which has a bluey-lavender colour, and the brilliant green variety has Ruby distributed through it (known as Ruby in Zoisite). The pink variety is known as Thulite. Charoite (also known as Charolite) – white, lavender, lilac, violet in a swirling pattern. Found only along the Chary River in Russia. 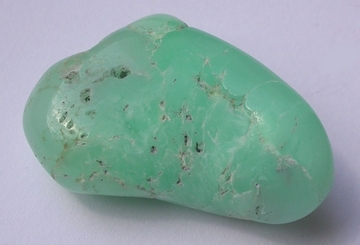 Jadeite – one of two minerals called Jade, the other being Nephrite. Nephrite, more abundant than Jadeite, is a creamy white to green colour, while Jadeite is usually green to grey-green, white or pale shades of blue or purple but can also be yellow or pink. Diopside – clear, pale green to pale yellow. The variety Chrome Diopside is a lustrous emerald green. Rhodonite – rose-pink, sometimes confused with Rhodochrosite which is streaked with white. Aquamarine and Emerald are both members of the Beryl family, which belongs to the cyclosilicate group. Red Beryl and Golden Beryl are the names of the gemstones given the Beryl name. Other members of the family are the greeny-yellow heliodor, pink Morganite and colourless Goshenite. 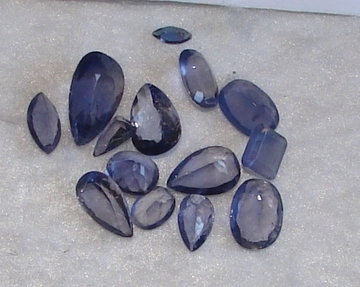 Iolite – blue to violet grey. 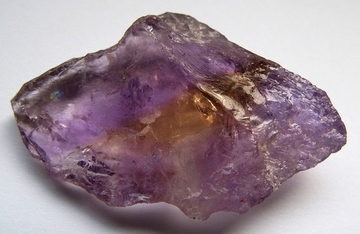 Iolite is pleochroic which means that it changes colour depending on the angle of light, from blue to yellowish grey. Another gemstone family in this group is Tourmaline, which is not, as many believe, a single gemstone. Elbaite is what we think of as Tourmaline, which comes in a variety of colours. The blue variety is also known as Indicolite, the pink or red variety called Rubellite and the green Verdelite. There is also a pink and green combination known as Watermelon Tourmaline. There are other minerals within this family but the most common for jewellery making is Schorl, an opaque black, known as Black Tourmeline. Chrysocolla – greeny-blue chrysocolla is too soft to use in jewellery in its pure form, so it is converted into an agate (chalcedony quartz) to give it stability. Labradorite - browny-grey, but displays a colourful shiller in certain lights, with flashes of blue, green yellow or violet, known as labradorescence. Sodalite - Sodalite contains sodium (hence its name)and its blue-white appearance is reminiscent of stone-washed denim. Lazurite is one of the components of lapis lazuli and from which lapis lazuli derives its rich blue colour. Lapis can also contain calcite, pyrite and sodalite to varying degrees, depending on its quality. Moonstone – colourless but with a labradorescent shimmer. Sunstone – flashes of reddish colour, also with a labradorescent shimmer. 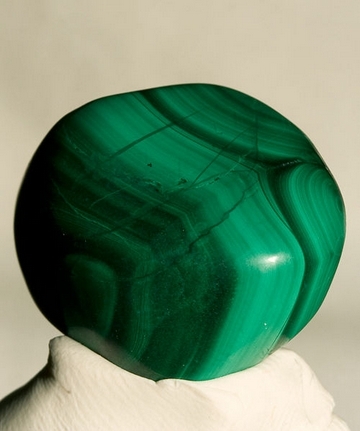 Aventurine – green, but also orange, brown, yellow, blue and grey. Rock Crystal – clear, crazed when heat treated. 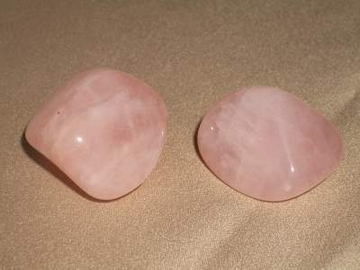 Rose Quartz – pink (quartzes with fruit names such as Cherry Quartz or Strawberry Quartz are not forms of Rose Quartz but made from glass). Sardonyx –reddy brown formed by layers of onyx and sard. 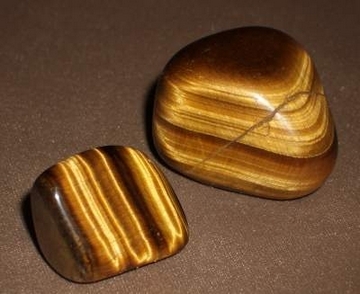 Tiger's Eye – golden yellow shot through with brown iron, providing the chatoyancy (tiger's eye) effect. Within the quartz family are the Chalcedonies, finely grained microcrystals (rather than single crystals) which impart patterns and bands to the stones. These include the stone named Chalcedony, a sky blue, and Chrome Chalcedony, green, along with all of the varieties of Agate and Jasper. Bloodstone (the birthstone of all we Arians, also known as Heliotrope) is a green Jasper shot through with red spots of iron oxide. Also coming within the Tectosilicates group is Opal. The best opals have a luminescence lacking in poorer quality stones. Flashes of all colours within the stone, depending on the light. POSTSCRIPT: Diamond is classified as an element. Being the hardest of all minerals it is in a class of its own! Please browse through my collections where you will find many of these beautiful stones in unique jewellery designs which you can buy for yourself or someone special.